Arts and Crafts is Kinderland's center of fine arts. 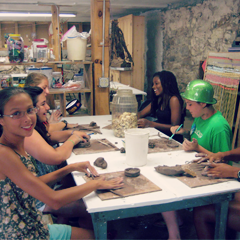 Campers work with looms, beads, baskets and dye, paints markers, pastels, mosaics, yarn, masks and jewelry findings. 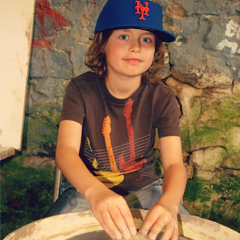 The pottery ceramics area is stocked with clay, wheels and kilns. 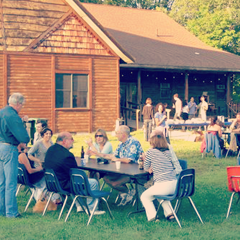 On the lower floor of the Paul Robeson Playhouse, just above the lake, A&C catches the lake and forest breezes. The shop is decorated with camper projects, and its outer wall holds our "Wall of Democracy", assembled from original tiles expressing the camper's thoughts about the meaning of democracy. 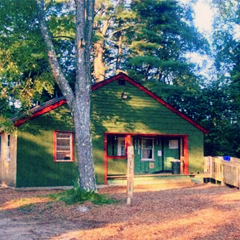 Campers live in groups of approximately 10-14 children, in wood frame cabins equipped with electricity and indoor bathrooms and showers. Depending on numbers, campers sleep in single cots or bunk beds, and each camper is assigned a "shafkeh", or set of shelves, to store clothing and belongings. Each simple and rustic building is named to honor lives lived in the pursuit of justice: Anne Frank, Goodman Schwerner and Chaney, Joe Hill and Harriet Tubman, to name a few. It is one of the very special aspects of life at Camp Kinderland. 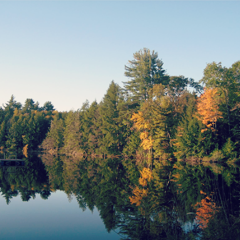 Our beautiful lake is entirely encircled by our own property. 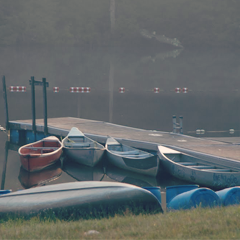 Our dock is a standard "H" which forms a shallow area at the beach end and an intermediate area reaching into the lake. The deep area is anchored by a floating raft and the entire supervised swimming area is roped off by floats. With star supervision, children can take out canoes, rowboats, and peddle boats during swim sessions. 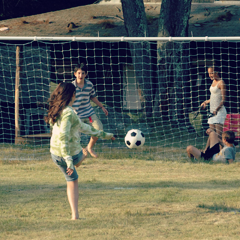 Camp Kinderland sports fields are right within the main camp facility, easily accessible fofr scheduled sports programs and spontaneous "pick-up" games during choice and "schmooze" (free time). Kinderland has two basketball courts, a softball field, a soccer field, a volley ball court and an open "lower" field used for relays, games, and ultimate Frisbee. 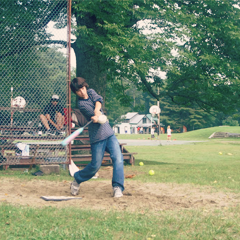 Specialists and guests also run games around camp using the fields and courts for Punchball, Kickball, Capture the Flag, Frisbee Golf, New Games, and Cricket. On rainy days the Paul Robeson Playhouse becomes the scene of everyone's favorite indoor madness, Ga-Ga. 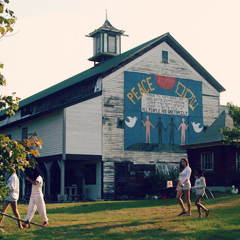 The Paul Robeson Playhouse is the performance center of Kinderland; its barn like structure has housed the concerts, skits, pageants and plays both performed and enjoyed by many generations of campers. The walls of Robeson are covered with camper-made murals that are a visually stunning testimony to the way values and creativity are integrated in our camp community. 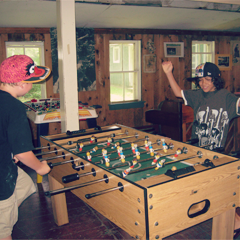 When Camp Kinderland built its new Dining Room and Kitchen, the former dining facility was transformed into much needed indoor recreation space. The current Rec Hall houses our dance space, staff canteen, library, culture center, and games space. There are several ping pong tables, a pool table, a foosball game, and long tables for gathering to play rainy day board-game favorites like Scrabble, Monopoly, Clue and Trivial Pursuit. Bunks may reserve the Rec Hall kitchen to prepare a "lazy day" breakfast. On rainy days the rec hall may also serve as an extension of the crafts shop; groups may gather to popcorn and watch a DVD; a group may choose to hold a celebration or party in the Rec Hall; and an outdoor screened porch offers added group meeting space. Our health center accommodates 8 campers - one small dorm for boys and another for girls, and an isolation room for people who need it. 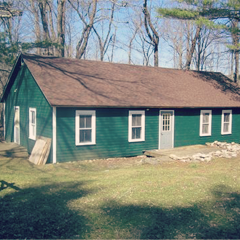 Two nurses live full time in the Health Center, and are available 24 hours a day, and are experienced in the management of a wide range of allergies and illnesses, along with the sprains, bug bites, rashes, and other minor health issues that arise at camp. They are also experienced in management of medications for specific needs such as asthma and attention deficit and other issues. Kinderland has partnered with Macony Pediatrics in Great Barrington, Mass., for more than 20 years; we retain a special driver so that children can get to medical appointments without delay. We also are connected to local pediatric dentists, orthopedists, and the Emergency Room at Fairview Hospital. EMT services are available at all times, and have responded within minutes on the very few occasions they have been called to camp. Whenever possible, treatment decisions are made in ongoing consultation with parents or guardians. 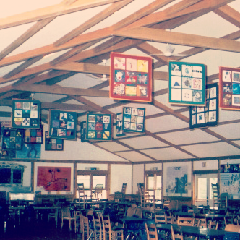 The Camp Kinderland Dining Room is a rustic and beautiful center for meals, snacks and many other activities at camp. Meals are served family-style; each age group actually has fun taking turns serving as waiters for the whole camp on an ongoing rotation under the supervision of their staff and the kitchen staff. Cuisine is generally kid-friendly, with an eye to balance and nutrition: lots of chicken, pasta, pizza, stir-fry, grilled cheese, and hamburgers; not much red meat or pork products; a good amount of fruits and vegetables, hot and cold cereals at every breakfast, a breakfast bar or salad bar at every meal, peanut butter and jelly available along with other substitutes at all times; and a vegetarian alternative at every meal that needs one.